Several days ago, one of my friends remarked that at least it’s Gone with the Wind that I can quote with ease, and not just Anchorman (although I can do that too), to which I responded that although this is true, it’s still only my dad’s edit that I can quote, only having watched the film in its entirety a couple of times. 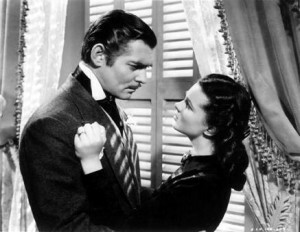 Do you mean to tell me Katie Scarlett O’Hara that Tara, that land doesn’t mean anything to you? Why, land is the only thing in the world worth working for, worth fighting for, worth dying for. Because it’s the only thing that lasts. This certainly didn’t resonate with young Scarlett at first, but Papa O’Hara had a point, though she didn’t really figure this out until her third husband left her and she went home once more. When you’re in love, it’s easy to lose sight of the things that were important to you before this person came along. It’s not such a big deal if you just shirk your responsibilities for a few weeks while you’re in the throes of new love and lovin’, but usually there should come a point where life readjusts itself to its usual pace, and you find a way to balance a partner with everything else. The problem arises when your dreams and goals take a backseat to your relationship altogether. No one likes to think about it, but most relationships that you have when you’re young are going to end, and you’ll eventually regret not pursuing what was important to you. Moreover, even if it doesn’t end, you’ll probably still regret it and become resentful toward that person, regardless of whether they had any input into you setting aside whatever it was that you set aside. A relationship is more important than a lot of things, like doing the dishes or a morning coffee (but only just). However, it’s not more important than you, and it’s good sometimes to check in with yourself and remember all the things you have, as well as all the things you want to have, outside of your relationship. Whether it’s a cotton plantation or (more likely) a dream job, you shouldn’t forget them when you find yourself a partner. No matter how babe-in’ they are. This article is so true, Dunja. You seem to have a way of perfectly putting things that everyone thinks about into words. Ah, the times I wish I had truly believed this when I was younger. Would have saved me lost of wasted time and heartbreak.